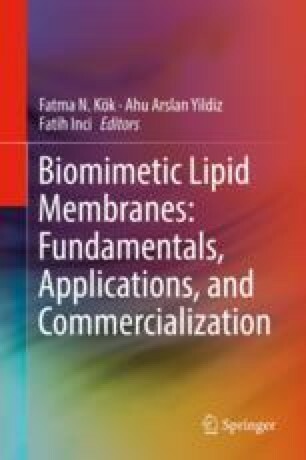 Transport of materials through cell membranes is of significant interest. We consider specifically the transport of gold nanoparticles that are in current use for delivery of pharmaceuticals, photothermal therapy, as contrast agents for imaging, and for targeted cancer therapy. We use coarse-grained molecular dynamics simulations to “observe” details of interactions between nanoparticles and a lipid bilayer model membrane during the permeation process. The nanoparticles are characterized at the molecular level (distributions of ligand configurations, their dependence on ligand length and surface coverage). Observation of membrane properties that agree with experimental values validates the simulations. We investigate the mechanisms of permeation of a gold nanoparticle, with either hydrophobic (alkane-thiols) or hydrophilic (PEG (polyethyleneglycol)) ligands attached via a sulfur covalent linkage to spherical (or nanorod) gold cores, and their dependence on surface coverage, ligand length, core diameter, and core shape. Lipid response such as lipid flip-flops, lipid extraction, changes in order parameter of the lipid tails are examined in detail. The mechanism of permeation of a PEGylated nanorod is shown to occur by tilting, lying down, rotating, and straightening up. Information provided by molecular dynamics simulations helps to understand why some systems work better than others, and aids design of new ones. The research described here has been funded by a grant from the National Science Foundation (Grant No. CBET-0730026/1263107/1545560) and the Department of Energy, Office of Basic Energy Science grant [Grant No. DE-FG02-08ER46538].